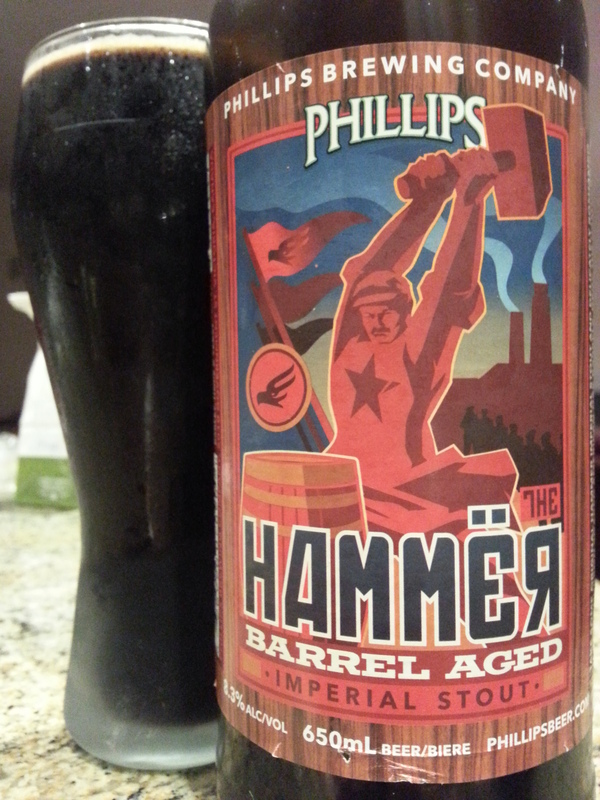 The Hammer Barrel-Aged Imperial Stout – Phillips Brewing (Victoria, BC, Canada) | Justintoxicated. Visual: The barrel-aged version of their Hammer Imperial Stout; I still have a bottle of it in my cellar but I expect this one to be better. Pours inkjet black with a smallish, very long lasting creamy head, a good layer of retention, lots of micro bubbly streams near the base of the glass. Finish: quick black pepper spiciness, syrupy texture, sweet roasted malt finish. Summary: An interesting complexity with a good body and balance. It has just a touch of watery mouthfeel near the finish but overall very nice for the price. June 10, 2016 re-tasting: Downgraded to B. Decent body and flavour, a bit lacking in body and carry in the mids to finish. It could also use more creaminess. A bit underwhelming the second time around, 2 years later.